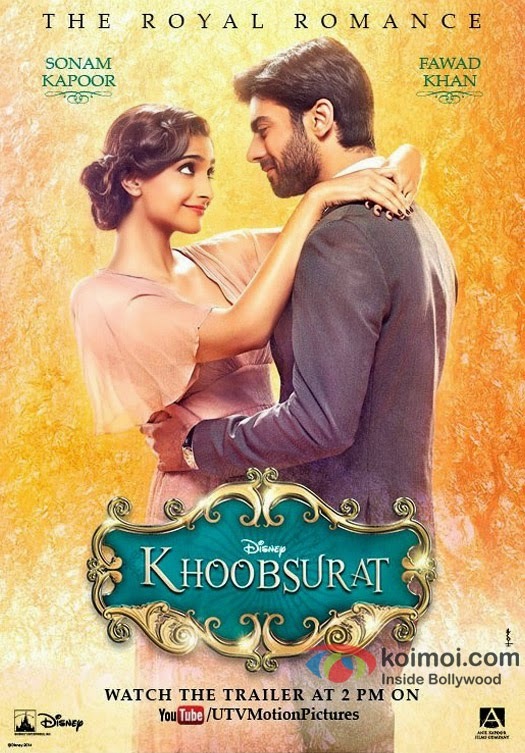 I am going to be honest, going into Khoobsurat I was highly-- and I mean HIGHLY--bias because of two reasons: Sonam Kapoor and Fawad Afzal Khan. Sonam Kapoor, despite mixed opinions of the masses, is one of my favourite actresses on screen currently and well, also one of my fashion icons, which is not a debated position that she holds despite people's personal opinions on her acting. Fawad Khan and I go way back before he became a household sensation (for very good reasons---I mean look at him!) in India. He is the recent import from Pakistan and I have been a fan of his acting (not so much singing) career for quite some time. So, going in I was hyped about two things: first, that I would finally get to see Fawad on big screen and second, two of my favourite actors were coming together on the big screen (which seemed like a near impossibility to think of before the rumours started). On to the movie. The trailer came out and I was instantly won over. They both looked good, acted good, the music was catchy, the casting was spot on, the story seemed interesting and the production work seemed well invested with promotional posters and pictures giving a real disney vibe. So I waited the long wait and September 19th finally rolled around and let me tell you, it was worth the wait. The story was familiar but the actors convincing and consistent. Its a really really good romantic-comedy, its light-hearted and fun--its everything you need on a rainy afternoon when you want to escape into an alternate universe of Rajput princes and royal misfits. The bad bits are that the editing could have been cleaner and the dialogues a little more natural. 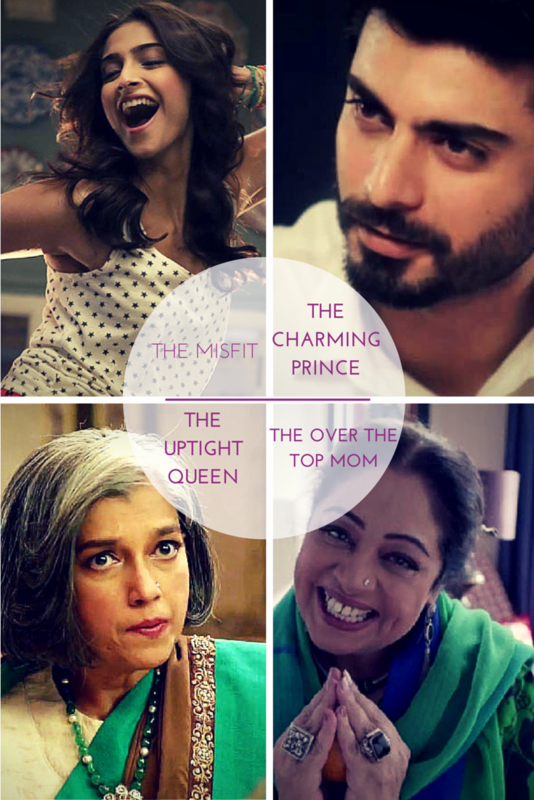 This is also a great movie for fashion as the styling for both Sonam and Fawad (even the character's portrayed by Ratna Pathak and Kirron Kher, their mothers) are dressed characteristically to the point. Where Sonam's Character Milli is a misfit and quirky and so her outfits are loud and fun, Fawad's character Vikram is dressed to show a business machine but yet still a Rajput Prince--so regal does business (faints). The music is great with Sneha Khanwalker, one of the industry's few female music composers, leading the charge in this at times folksy and at times eclectic sound track. Badshah's "Abhi toh party shuru hui hai" is catchy and definitely going to get a lot of plays at parties. Even Khanwalker's screamer/loud "Ma Ka Phone" won me over. My favourite of the soundtrack is "Preet" an emotionally packed song with the haunting voice of Jasleen Royal. All in all its a fun film and it definitely highlights what bollywood does best: a good family centric rom-com, taking cinema back to a simpler time where action, explosions and low-grade comedies weren't topping the box office and a movie was sold on its story line. I had no idea Disney had done an Indian movie! That's so exciting! I really haven't watched many Bollywood movie, but this can be a great opportunity! Thanks for sharing!! Cant agree more, we watched this movie for a GNO, it was super funny and entertaining and I fell in love with all of Sonam's colorful outfits!!!! Great review - I love Sonam Kapoor too! Oh this is a news! I must watch this. I like Indian movies so an India's first disney fairytale must be a try.